If you’ve ever noticed that you look radiant in a certain colour, or ill in another, you’ve seen that the colours that are around you, affect how you appear. Which is a bit weird, when you stop and think about it. Doesn’t it feel like what you see is what’s actually there? It does to me. But if a different colour can change how you look, then that can’t be entirely true. So … what’s up with that? That’s because we (human beings) do not see objectively, we see comparatively. Basically, we work out what we’re looking at by comparing it with what’s around it. I’m sure you know where I’m going with this. Both circles are the same colour. They don’t look the same because the colours around them change how they look to us, because our brains are trying to distinguish them. They’re comparing. And when we compare the circle colour to orange, it’s relatively pinker, so pink is what we see. When we compare it pink, it’s more orange, so we see orange. Not convinced they’re really the same colour? I actually see a gradient here, but there isn’t one — that’s testament to the power of simultaneous contrast. Even when we know the colour is the same, we’ll see differences where the adjacent colours differ. So, colours next to each other affect each other. And … ? And, you are made of colours! Your skin has a myriad of colours, and so do your eyes, and so does your hair. When I look at you, I’m seeing lots of colours. So if colours next to each other affect each other … then the colours next to you will affect your appearance. Let’s change the colours from the example above. 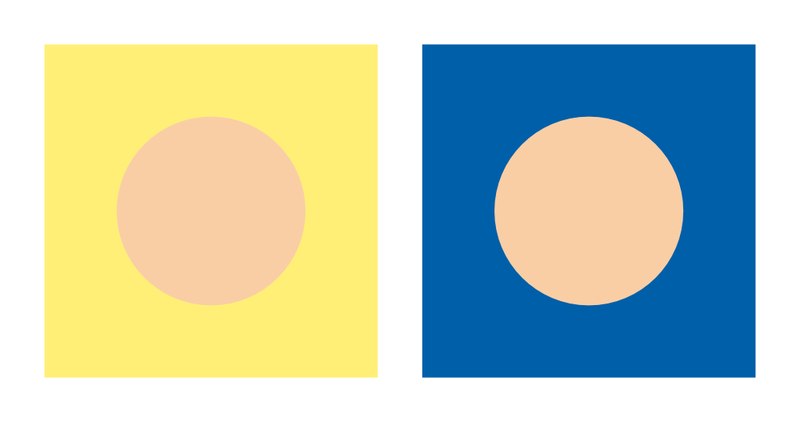 The two circles are identical in colour and size. 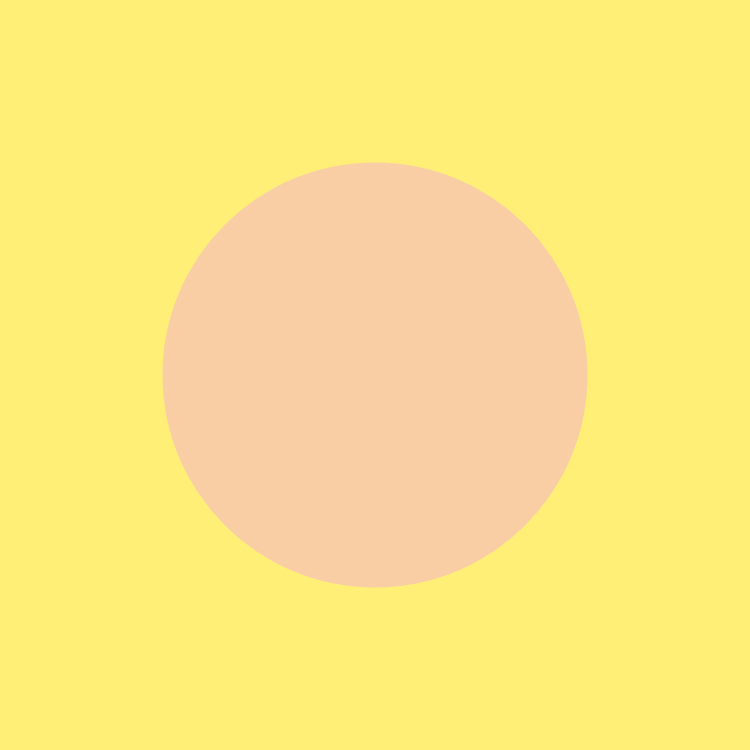 Again the colour of the circle is changed in my perception, depending on the colour around it. But the colour isn’t the only difference. These two colours are disharmonious. These two colours are harmonious. Ok, so in our silly premise, this circle is your face. Which version of the circle would you rather be? Harmonious colours will make you appear in focus, present, coming forward (even as though your posture has instantly improved — I see this all the time). When you look like this, people will see you more clearly, they will be able to connect with you, and that leads to liking, trusting and understanding you better. Disharmonious colours can make you appear blurry or far away, literally difficult to see and therefore difficult to connect with. So, what makes a pair of colours either harmonious or disharmonious? Short answer: whether we see them together in nature, or not. Natural colour harmony is exactly what it sounds like: the way we see colour in the natural world. Human vision evolved during the millennia when that was everything there was to see, so your brain and eyes are calibrated for nature. Natural harmony is not only easy to look at, it literally makes you feel good. This is part of the reason we go to natural environments, like beaches or forests, to de-stress. Man-made objects or environments are not necessarily (or often) coloured in ways you would see in nature. The problem with this is simply that adjacent colours that you would not see together in nature are hard work for your eyes and your brain to take in. You’re not evolved for them. Keep looking and you’ll eventually feel some eye strain, fatigue or even the beginnings of a headache. That’s what’s happening in the yellow square up above. The point of Personal Colour Analysis is to find the colours that are naturally harmonious with you, so that when we look at you (and when you look at yourself in a mirror), it’s like looking at nature — it feels good, and the more we look, the better it feels. Have a comment or question about this post?